Earlier this week, General Electric announced that it is initiating an entrepreneurial effort to commercialize its solid oxide fuel cell (SOFC) technology for megawatt-scale stationary power applications. Billion-dollar fuel cell startup Bloom Energy also works with SOFC technology at this scale. GE has claimed a recent fuel cell "breakthrough" with an efficiency of 65 percent (when used with a Jenbacher engine) and an overall efficiency of up to 95 percent when waste heat is captured. Johanna Wellington, advanced technology leader at GE Global Research and the head of GE’s fuel cell business, stated in a release, “The cost challenges associated with the technology have stumped a lot of people for a long time,” adding, “we made it work, and we made it work economically." 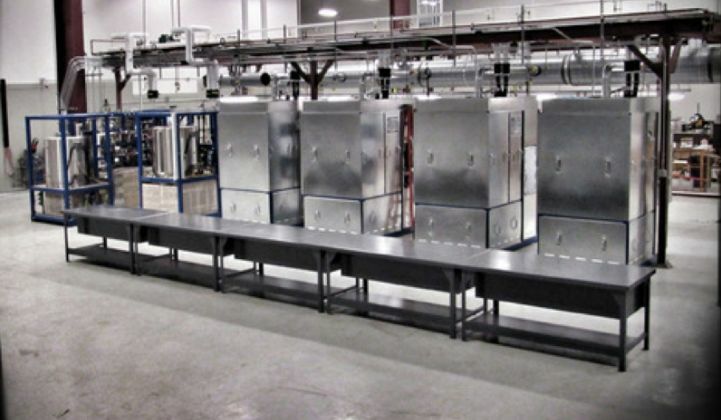 GE materials scientist Kristen Brosnan states that using an additive thermal spray technology "to deposit the anode and the electrolyte" makes it "easy to apply, [allowing it to] handle large temperature swings and...last a long time." That's the "game-changer" claimed by Wellington. Martin LaMonica reported on this year's SOFC fuel cell breakthrough from GE a year ago in IEEE. He wrote that GE was combining "proprietary fuel cell technology with its existing gas engines" to replace diesel generators. LaMonica also noted that GE's fuel cell technology was meant "to work in tandem with GE's engines." He wrote that the system is still a few years away from commercial availability and is aimed at customers outside of the U.S., where natural gas prices are not so cheap. Wellington's predecessor as director of GE Global Research, Mark Little, also claimed a "real breakthrough in fuel cell technology" at the time. GE has been working on SOFC technology for decades. 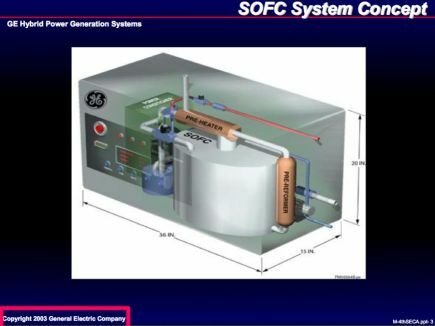 Here's an SOFC slide from GE dating back to 2003, about the same time that Ion America was changing its name to Bloom and investing $1 billion into development for its still-unprofitable fuel cells. GE plans to build a pilot plant and development facility near Saratoga Springs, New York. There are seventeen people currently involved in the program, according to the website GigaOm. Vlatko Vlatkovic, chief engineering officer of GE’s Power Conversion division, said in an interview with Bloomberg, “It’s almost impossible to do a good fuel cell without platinum as a catalyst,” which is why GE went the SOFC route. But Vlatkovic also said that that an actual product is still “very far off." The GE Conglomerate had $146 billion in revenue last year. Michael Kanellos, one-time editor-in-chief at GTM, suggested that it would be a conglomerate like a Siemens or GE that would eventually take fuel-cell technology to market, rather than a startup like Bloom. Another conglomerate, UTC, which has an extensive fuel-cell pedigree, actually paid ClearEdge Power $48 million to take that firm's fuel cell business off its hands. See below for the eventual outcome of that transaction. Doosan of South Korea, a conglomerate with $21 billion in 2013 revenue, just purchased the remains of bankrupt fuel-cell aspirant ClearEdge Power. The assets and debt sold for $32.4 million, according to the Yonhap News Agency, which reported that ClearEdge had 2013 revenue of $68 million. Dow Jones reports that the original bid was at a higher figure of $48 million. ClearEdge raised more than $136 million in VC funding since its founding in 2006 from Kohlberg Ventures, Applied Ventures (the investment arm of Applied Materials), Big Basin Partners, and Southern California Gas Company to develop and build a proton exchange membrane (PEM)-based fuel cell for residential and small commercial applications at hotels, multi-tenant buildings and schools. In December 2012, ClearEdge acquired the fuel cell business of technology conglomerate United Technology Corporation (UTC) and switched out its core PEM product to the UTC phosphoric acid technology for its 5-kilowatt and 400-kilowatt offerings. The natural-gas-powered UTC 400-kilowatt fuel cell unit had a reputation in the industry as one of the higher-performing products. UTC Power was spun out of Pratt & Whitney in 1958 and supplied fuel cells to NASA for space missions from 1966 through 2010. Around the same time as the April bankruptcy, Ballard Power acquired UTC's transportation- and stationary-related fuel cell IP assets for $22 million. Earlier this month, PEM fuel-cell maker Intelligent Energy went public and raised $94.1 million. The company was valued at $811 million, making it the most highly valued publicly held fuel cell company in the world. We look a bit deeper at the fuel cell market here.